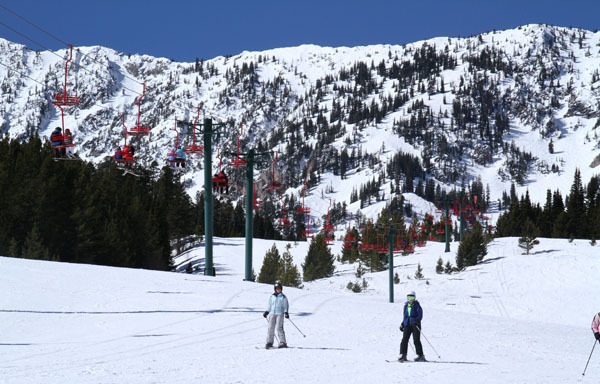 Bridger Bowl isn’t a big name Montana resort, like Big Sky or Whitefish, but it should be. 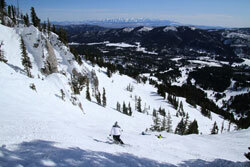 Bridger Bowl Ski Area is super easy to get to, just 20-minutes from Bozeman, worth the trip! 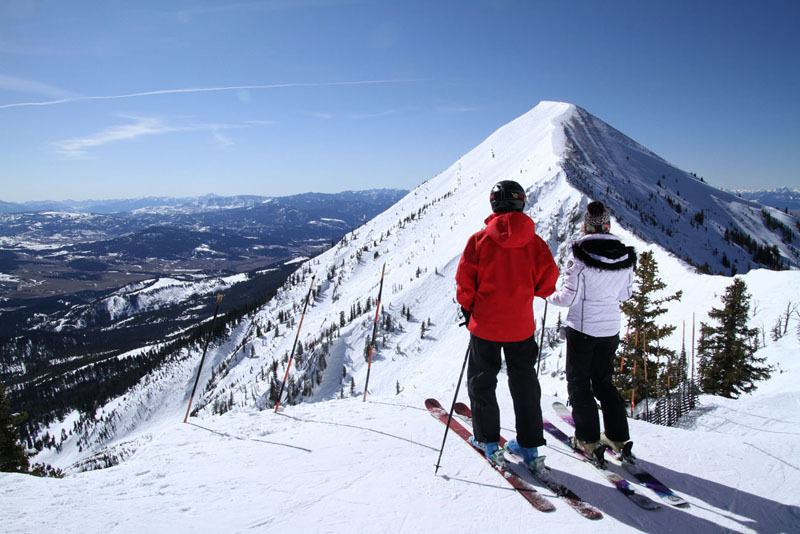 Bridger is a gem with 2,000 acres of amazing terrain on the East slope of the Bridger Mountain range with spectacular scenery of the Yellowstone River and the Crazy Mountains (real name). Bridger is located in the Gallatin National Forest, its kind of old school, with a homey vibe and great skiing. 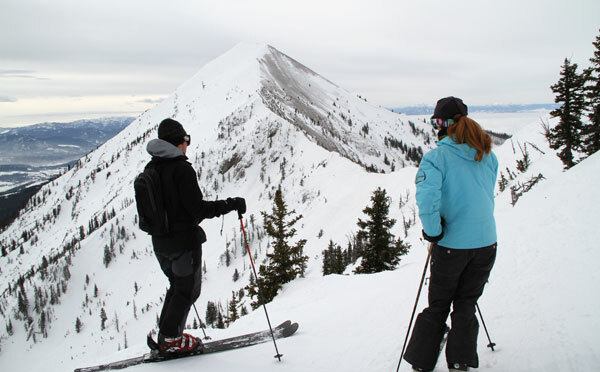 Skiers in the know go to Bridger for its impressive 8,800’in bounds backcountry style Ridge terrain which is two miles across. This Bridger Ridge offers insane steeps, sick chutes in Nose and Mundy’s bowls that spawned extreme free skiers like Doug Coombs and Scott Schmidt. Skiers used to have to hike to reach the Ridge, but a double chair now accesses the Ridge, though you must have transceivers as part of avalanche safety. Proof of peeps is required as you load Schlasman’s lift (named after a miner that died here in an avalanche – and a reminder of the risk). But on the flipside, Bridger is a playground for families, with ego-pleasing wide open satiny snow in North and South Bowl, Sunnyside, and the Alpine Face with a handful of groomed runs. Bridger’s slogan is “ski the cold smoke”, and they get a bounty of natural Montana snow, with only 5% snowmaking, and a bunch of local Bozeman skiers on a powder day. Bridger really does have terrain for everyone in the family, steep backcountry style chutes from the Ridge, to wide open bowls, terrain parks, and groomed blue and green runs on the lower mountain. 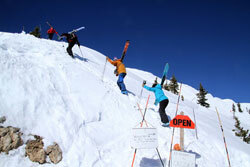 Bridger also hosts a roster of fun ski events, King and Queen of the Ridge, the Apron Challenge, a Dirt Bag Ball, races, and terrain park contests. Rather unique, Bridger is a private, nonprofit 501(c) 4 organization. That makes it sound low budget, but the membership based organization and Board (all Montana residents – 18 yrs and older) have reinvested and added numerous new lifts and three spectacular new Rocky mountain lodges in the last decade, impressive at a time when many real estate laden resorts have verged on bankruptcy including nearby Moonlight which has been bought and merged with Big Sky. 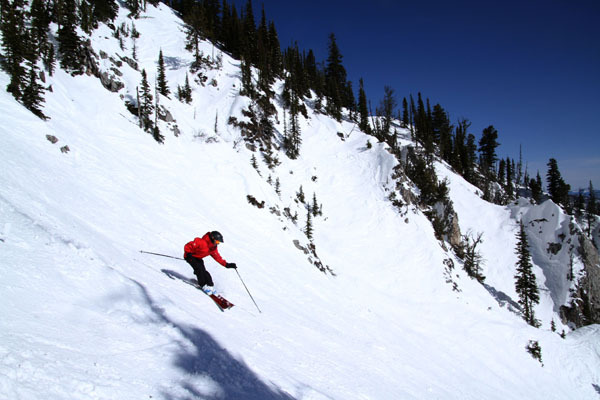 Bridger Bowl has no slopeside lodging, its within National Forest, but Bridger is one of the most easily reached western resorts, 14 miles from Bozeman, past bison, horses and elk farms. For table service lunch and après ski at Bridger, go to Jimmy B’s at the namesake Jim Bridger Lodge with views of the ski slopes. For a casual quick bite on the go, the Alpine Cabin Lodge is a great spot off Alpine’s Limestone Run served by the western most Alpine triple.